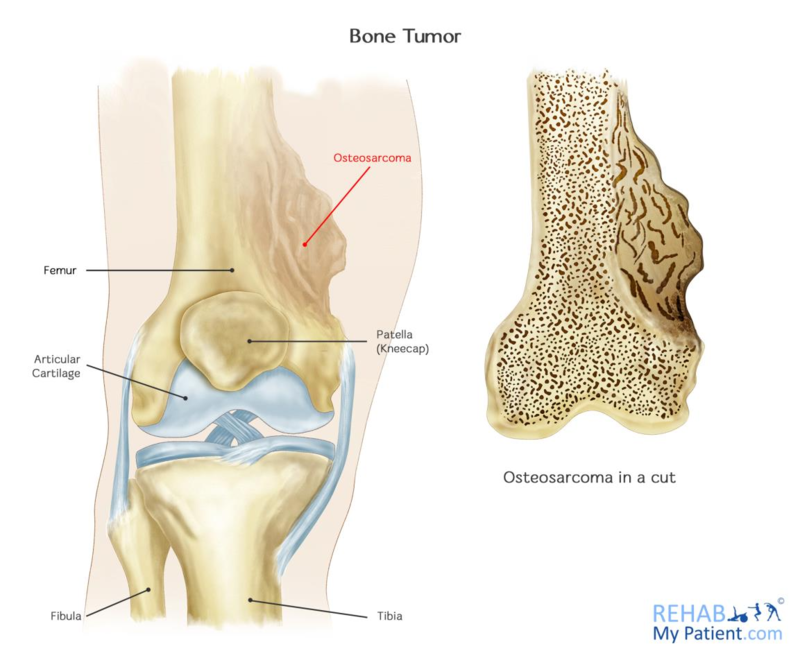 Osteosarcoma is considered to be the most common form of cancer developing within the bone. Just like all of the other osteoblasts within normal bones, the cells forming this cancer complete the bone matrix, but this matrix isn't as strong as that of normal bones. Most of the time, this condition is present in young adults and children. Teens tend to be the most commonly affected of all individuals, but osteosarcoma can occur at any point in time. Osteosarcoma literally means bone growing tissue cancer. It’s a serious problem, and can be life threatening. It most commonly occurs in children who are going through puberty, and osteosarcoma often develops in areas where the bone appears to be growing quickly, such as at the spots near the ends of the longer bones. Most tumors develop in the bones surrounding the knee, the distal femur or the proximal tibia. The proximal humerus is the next common of all sites. An osteosarcoma can occur in any one of the bones, including that of the hips, jaw and shoulder. Some bone tumours are benign, and not life-threatening. These are usually known as osteochondromas. Osteosarcomas unfortunately are malignant and account for 20% of all primary bone tumours. The current 5-year survival rate is 60-80% following medical treatment. The bone cell becomes abnormal or mutates, and grows out of control. The cancer cells are like bone forming cells, known as osteoblasts. This leads to a type of osteosarcoma known as an osteoblastic sarcoma. Sometimes the cells look different to bone cells and this type is known as either a chondroblastic osteosarcoma as the tumour tries to form cartilage too, or a fibroblastic sarcoma where fibres are made instead of bony cells. The rapidly growing bone cells joint other bone cells that form a tumour on the bone. This often occurs just above or below the knee joint. The cancer can spread into the blood steam and to other sites, like the lung. Diagnosis is made by X-ray, CT scan or MRI scan. Its difficult to diagnose without a scan, but typically presents as unrelenting bone pain in the knee in young teenage children. The pain just develops for no reason, rather than being related to a sports injury. Night pain may also occur. The pain typically does not respond to conservative measures or physiotherapy, so at this point a scan is usually requested to further investigate the knee joint (or whichever joint is affected). Chemotherapy is one of the drugs used for treating cancer, which is often administered in an artery or vein. The drugs work their way through the bloodstream to destroy the cancer cells present in the body. In many instances, osteosarcoma makes its way into the lungs or other organs, even when these tumors cannot be seen on imagine tests. Due to this, chemotherapy is a critical form of treatment for most cases. Surgery includes a biopsy to diagnose the cancer, as well as the surgical treatment. It is an integral part of treatment for just about all osteosarcoma sufferers. The main goal when going through surgery is to remove all of the cancer. Even a few cells can multiply and grow to form new tumors. To make sure this doesn’t happen, surgeons will often remove some of the normal tissue surrounding the tumor. Sometimes amputation is necessary. Osteosarcoma risk is highest for those between 10 and 20, especially during the growth spurt teenagers go through. Children who have this condition are generally tall for their age. More males will struggle with osteosarcoma than that of females. It tends to be slightly more common in African Americans than it is in whites. Those who were treated by radiation therapy from another type of cancer have an increased risk of developing the condition in the area that was previously treated.